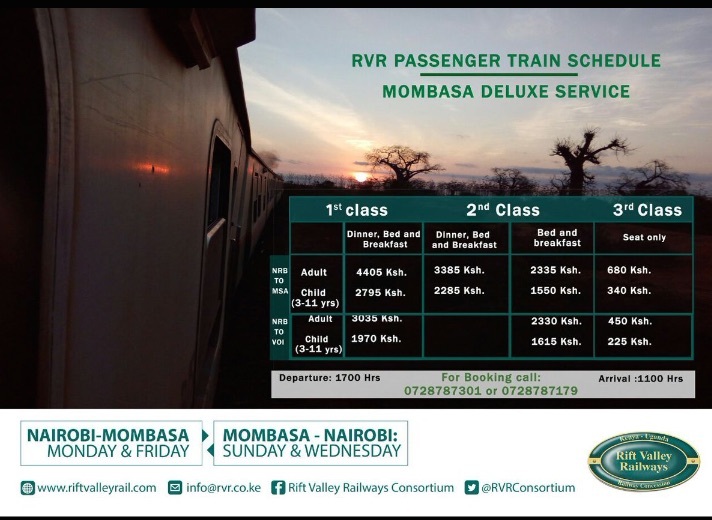 A review of the Madaraka Express SGR service between Nairobi and Mombasa, Kenya using the Business Traveller format of train reviews. Background: Kenya launched the Madaraka Express, a new passenger service train service when the Standard Gauge Railways in May 2017 that replaced the ‘old’ Kenya Railways train service between Nairobi and Mombasa and which was discontinued just a few weeks before the launch. China Road and Bridge Corporation built the new standard gauge railways (SGR) and Africa Star Railway Operation runs the train service for Kenya Railways. Booking: You buy all tickets online, and you have to choose – first (costs Kshs 3,000) or economy (Kshs 1,000). There is no seat selection or seat map. You then pay via M-Pesa and get an SMS with the seat selection and ticket number. The ticket price is a flat rate, with no difference in prices for weekends, or midweek. The booking site also shows the number of available seats and you can book for several people, but there are some rules about large group bookings. Getting There: Nairobi’s SGR station is located about 8 kilometres from the Jomo Kenyatta International Airport and 15 kilometres from downtown Nairobi while the one at Miritini station that serves Mombasa is a corresponding distance from the airport there and centre of the island. You can get to either station by using a taxi service like Uber or Little Cabs. Even though you are going to hot Mombasa, dress warmly for the SGR ride. Don’t get on board in T-shirt and beach shorts as the train is kept at a cool air-conditioned temperature for the duration of the ride and the windows don’t open. At the SGR station, you go through a few security checks – sniffer dog, bag x-ray etc. There are different rules that are not clear and some people are allowed to bring food onboard, but other items like visible alcohol bottles and cigarette lighters are confiscated from passengers. You then go and print your ticket stub from a vending machine, which you have to show to enter the station. You enter the number that was sent to your phone via SMS and you can, for good measure, also print one for the return leg. Boarding: At Nairobi, there is a lounge for first-class passengers that is separated by a screen from the economy ones. First class passengers board first from their lounge, and parents with children are given boarding priority. You walk across a bridge from the lounge and down to the train. There are escalators at both Nairobi and Mombasa stations and some lifts, but they can get crowded. You find, your coach and there’s another ticket check at door. The train has about eleven economy coaches, and two first-class ones, according to the announcer, with numbers one and two at the back, next to the dining car. Seat: Once on board, you have to sometime be firm on the seat you paid for as some people arrive and want to sit on a different seat in the first-class cabin that is in a 2-2 layout. Window seats have a socket and you want to sit next one where you can plug your gadgets in to charge. I got the impression some people buy two seats so they can stretch out in the extra space and nap without being bothered by a seat companion who may be a noisy, messy eater. There is enough space in the overhead bins, and large suitcases are placed at the end of the carriage near, or under, the sink. It would be nice if there were some proper luggage racks, but there is ample space. The tray table, which pulls out from the seat in front, is wide enough to rest a laptop computer on. But it has no slots for cups, so if you are reading or working on a laptop, it is available to hold your cup. The train sways gently, but it is more likely you will knock over the cup or someone passing may bump it by accident. Journey: The train pulls out of the station on time at 2:35 P.M. It accelerates slowly on through past the many cement factories in Athi River town, the African Heritage House, and other familiar sights. It doesn’t really pick up speed, in this area with slight curves, until it starts descends the plains, and the rail straightens. 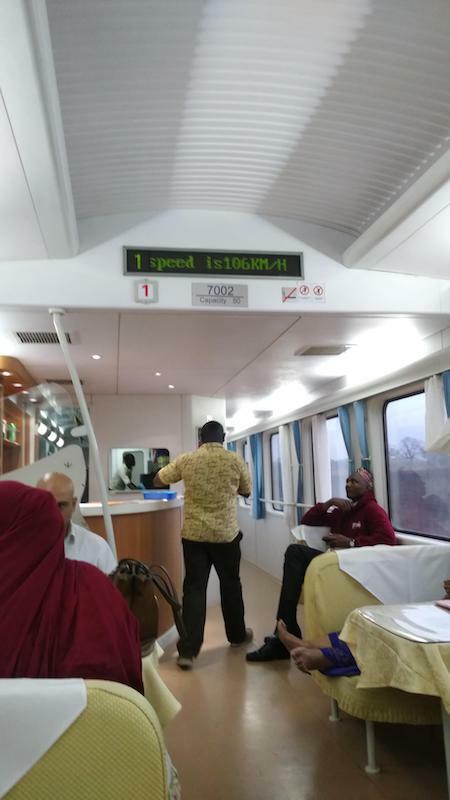 Most of the journey is done at speeds of about 110 Km/h (70 mph) and the train is very deceptive in its speed, which is displayed on a small screen in the coaches. You never get a sense of the speed until you pass a car on the highway or see a helicopter slowly pass overhead and you realize just how fast the train really is compared to these other vehicles. The entire railway is double fenced, zoning off the SGR from the communities that it passes through on the 400-kilometre journey. The afternoon train is a non-stop one. Unlike the old train which would slow to stop in small towns and in which passengers tourists would stick their heads out of windows, watching the passing countryside or to count the number of coaches of the train as it turned, this new rail has few curves and the train hardly bends. There are no roads to cross, and instead, the train is elevated far above the ground as cars pass underneath. School kids, who used to stop and wave at travellers on the old train, do not bother to stop playing football to even glance at this fast-moving one. Service: In first-class, a drink cart was rolled down the aisle with a snack, and free serving of coffee or tea is served, but the service is rather slow and clumsy. Later they served drinks, for sale, which were rolled down on an old airline-style cart, with a selection of beers, wine, soft drinks and snacks, but the cold drinks are not really cold. Even warm ones can run out and you may have to switch what you are drinking. It is better to go straight to the dining car where you can have more cold drinks and snacks. The train ride is not too long, so you won’t be eating large meals like the elaborate full dinner and breakfast meals that the old train used to serve in first-class. The same beer that was Kshs 250 in the VIP at the station is now 350 here. Also, the Mombasa station also has a first-class lounge upstairs but there is no restaurant there, yet. There is no Wi-Fi or screens, but you get good service on Safaricom internet service for most of the way. Some passengers had iPads which they used to entertain children they were travelling with. Arrival: Accessing the station at both ends can be stressful At Mombasa having arrived at about 7:15 P.M. it took about two hours to get to our destination by historic Fort Jesus. The new highway, that is still under construction, takes about fifteen minutes to reach the junction to Mombasa airport. Then it took us one and a half hours to negotiate the traffic that had overlapped and got stuck on the dusty Makupa Causeway, with matatus, tuk-tuk’s and other vehicles going off-road and meandering between long-distance trucks. Some vehicles had they engines off and truck brakes had a burning smell. The cause of the jam was a lorry that had gone off the road just as the causeway enters the island. The return a few days later took about a half-hour from town. Regardless of if you take the SGR, or fly into Mombasa’s main airport, you are stuck on the same highway that is under repair for the next few weeks. Verdict: The 66 people in the first class train cabin are equal to the number on a typical bus on the Nairobi-Mombasa highway, while each economy coach (there were eleven) has almost double that number of passengers. Also, the 50 wagons on an SGR goods train of which you pass one or two during the journey are equal to 50 fewer trucks off the Nairobi-Mombasa. See also Owaahh’s “The Man Who Sold A Country” for more on the impact of this new railway. Good points: The time-keeping, the on-time departures and arrivals. Also, the new SGR service crew make many announcements, about making good use of a shared public facility. When KFC came to Kenya and later Subway and other fast food-joints followed, they introduced the idea that patrons should clean up after themselves and dispose of their assorted papers, cups and leftover food in large bins provided. On the SGR they keep broadcasting announcements throughout the trip reminding passengers about cleaning up their space, not littering, not sticking gum under the tables, etc. They also ask people travelling in groups to be considerate of others in terms of their conversations and music. But other passengers played music on their phones, without using headphone, and there was a cacophony that competed with music blaring from the train’s overhead speakers. Some groups ignored this and a few people don’t use headphones and you often have competing sounds in the cabin, including songs on the train PA in-between announcements. While others heeded the advice and took their loud conversations to the dining car where they could sit facing each other and discuss their trips and business plans over plenty of alcohol. There is also some camaraderie in first class, and people share tables as they enjoy drinks and watch the rapidly passing scenery. In Nairobi, Kenya Railways also runs a commuter service from the old railway station in downtown Nairobi to the SGR station. They time it to shuttle passengers who are connecting on the SGR Nairobi. This costs Kshs 50, a fair deal, compared to the cost of using a taxi which is at least ten times more. The commuter trains makes two stops at Imara Daima and Makadara. Bad points: The odd toilet rule about not throwing anything, even tissue, down the toilet does not make sense. Their instructions are to dispose of toilet paper in a bin on the floor?? Yet the toilet seems like the same standard vacuum flush that planes have. BTW, the old train used to flush straight down and fertilise the side of the tracks. JOURNEY TIME 4 hours, 35 minutes (Nairobi to Mombasa). SEAT CONFIGURATION 2-2. Seats can rotate backwards but no one tried to turn them around. People went to the dining car for face to face meetings. PRICE: Advance first class fares from Nairobi to Mombasa are Kshs 3,000 (about £23 / $30) for a one-way booking, which you make online and pay for via mobile money (M-Pesa). You must enter the name and ID/passport number of each traveller. This entry was posted in Kenya economic growth, Kenya Railways, Mombasa, SGR on October 29, 2018 by bankelele. Kenya’s National Land Commission (NLC) has again published a list of land titles it is seeking to acquire on behalf of Kenya Railways for the construction of Phase 2A of the Standard Gauge Railway (SGR) between Nairobi and Naivasha. The parcels are in the counties of Kiambu, Kajiado, Nakuru, and Narok. Big winners include Kedong Ranch Ltd as they will be compensated for three huge land parcels (measuring 35.7 hectares, 13.01 hectares, and 100.65 hectares) that were previously listed as being belonging from Morning Side Heights, Ruaraka Housing Estate, and Morningside Heights respectively. Another is Kiambu Western Grazing Area from who the NLC will purchase 146.8 hectares. Big losers include the Nairobi National Park which is managed by Kenya Wildlife Services (KWS) and which is billed as the only national park within a capital city in the world which will lose loses 41.3 hectares (about 102 acres) which will be hived from land title – L.R. 10758 that was reserved. The Nairobi National Park was originally 28,950 acres in 1961 when a 999-year lease was granted to Trustees of the Royal Nairobi Parks. Another loser will be Oloolua Forest 17.3 hectares (about 43 acres) to the railway, at a time when Kenyans are concerned about depletion of forests.There have been news reports that construction work for the SGR has commenced in the Nairobi National Park park in the last few weeks. Construction through the park had been contested for some time, and back in November 2016, a session was held at the Strathmore Business School where Kenya Railways staff met wildlife conservation groups, and concerned residents, to explain issues like the intent of the government, justification for the SGR, land rights, the railway route, land acquisition cost, feasibilities done, stakeholders consultations, impact on wildlife, environmental and community impact etc. Athanas Maina, MD of Kenya Railways said that it was not possible to follow the corridor of the old (British) railway, which would not be funded and whose terrain was difficult – and that they had considered seven different routes through which the new railway could exit Nairobi to pass through a crucial tunnel at Ngong. 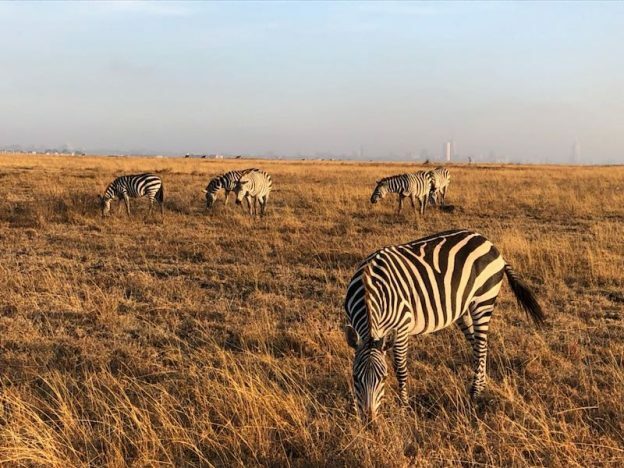 They had settled on a “modified savannah” option and the new SGR railway would loop back from the Inland Container Depot at Embakasi, and go over six kilometers of the Nairobi National Park. This would be achieved by constructing elevated bridges in three stages, and running the railway elevated at an average height of eighteen (18) metres over the park with noise defectors and that construction would be completed in 18 months. The acting Chairman of the Friends of the Nairobi National Park said that if there was a conflict between conservation vs development, it is because of a lack of planning and consultation, while another representative spoke of continuous assaults on the Nation National Park over the years with demands for the park to cede more land for construction of the Southern bypass highway, oil pipeline, and fibre cables among others. Finally, a letter from Richard Leakey, Chairman of the KWS, was read out in which he said that the SGR would have minimal impact on Nairobi National Park, and mainly during the two years of construction. 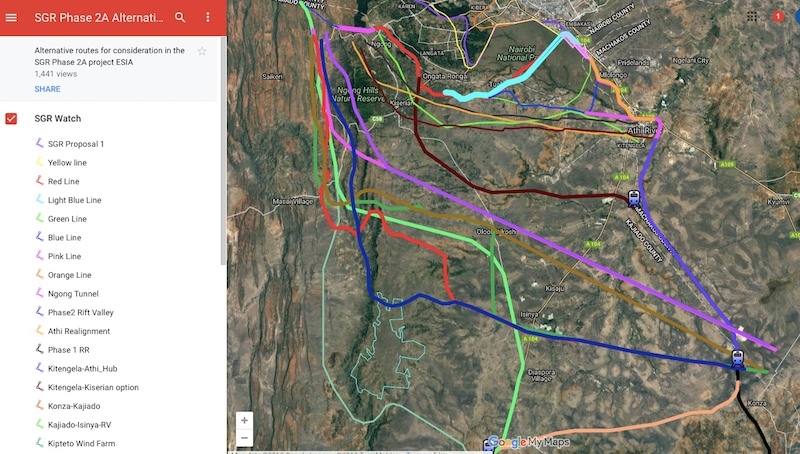 He added that some conservationists had opposed fencing the southern part of the park for many years because wildlife species migrate through there, and if the railway was laid and fenced there, outside the park, it would cut off wildlife from accessing the park. That ended the debate, that day. This entry was posted in Kenya procurement, Kenya Railways, Kenya real estate, LAPSSET, Nairobi National Park, SGR and tagged SGR, Wildlife on March 4, 2018 by bankelele. This is the first class cabin of the lunatic express, the 120-year-old Kenya Railways line (operated by Rift Valley Railways – RVR), that the Standard Gauge Railway (SGR) is meant to improve on. The cabins are about 40 years old; they are mostly used by tourists or adventurous travelers and families taking scenic journeys to and from the Coast or Rift Valley. 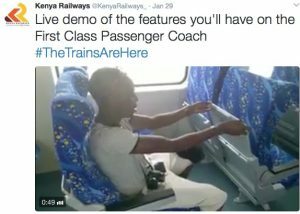 It was disappointing to see pictures from Kenya Railways of what #SGR “first class” will be – it looks like a third class with swivels seats – this after a $3.2 billion mega-project?. Yes, the trains will move faster, but apparently, they won’t go too fast because this is Kenya where they may encounter people or wildlife on the tracks. By looking at this chart of train cabin seats in China, KR is a correct, but the first class of China and the new SGR is not the same as the first class on the old (RVR)/Kenya Railways. China has first, second, and business class (which has lie flat seats) like an aircraft – but no economy class. 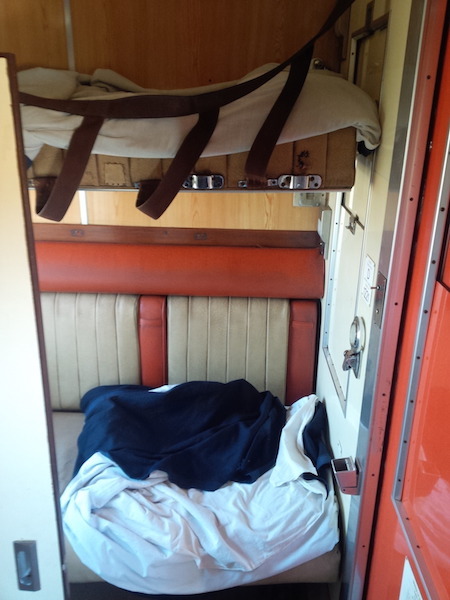 What we know as the first class of the old Kenya railways, qualifies as a luxurious “sleeper coach” in China which offers privacy and comfort. SGR Journeys will be faster, perhaps 5 hours from Nairobi to Mombasa compared to the current train service by RVR which takes 15-20 hours. The train is also used by hundreds of residents who live in small towns along the railway and who will appreciate the improved new cabins. But will Kenya Railways offer some new sleeper cabins to improve on the old railway service? The Kenya Economic Survey 2016 shows there has been a continuous decline in rail passenger indicators of journey, passenger-km and revenue. The major reason is prioritizing on the freight, which is more profitable than passengers’ services hence the available locomotives are prioritized to freight. This entry was posted in Investing in Kenya, Kenya domestic tourist, Kenya economic growth, Kenya Railways, Rift Valley Railways, SGR and tagged Railways on January 31, 2017 by bankelele. For a long time, motorists on the road trip to Mombasa had endless savannah and semi-arid brush-land as their only view, with few sizeable towns and centres along the highway. Many travelers would drive the long stretch between Nairobi-Mtito Andei or even up to Voi, before deigning to stop for refreshments and use of sanitation facilities at what were mostly only petrol station joints. Many of the Colonial era taverns and Inns along the Highway had fallen either into disrepair or closed completely. 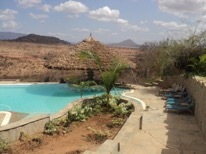 And a night in Voi meant accessing the adjacent Tsavo East National Park to stay in Voi Safari Lodge. Not anymore. Recent events have led to a great change in the landscape along the Highway. Sure the great vast ranches of Konza are still largely intact but urban development has become a major feature of the highway with numerous new centres expanding and what were once junction centres now turning into overnight stop points or places of bustling with 24-hour economic activity. A number of factors have contributed to these developments and are manifested in some of the features observed. 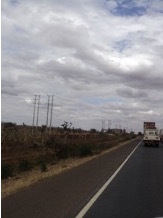 Konza City: Previously tiny centres such as Kyumvi (Chumvi) or the Machakos turnoff have now become major truck stops. Investors have established vehicle sales centres nearby and the price of land is sky rocketing going by rough quotations one receives. Further along is Malili centre which sprung up once news of the plan publicized by the grand coalition government about a new Technological (ICT) city to be built at Konza, that was meant to take away pressure of land and space from Nairobi. 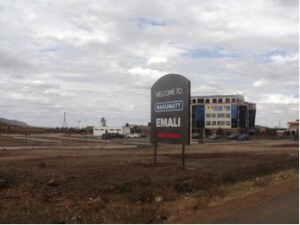 The city was touted as a Kenya’s Silicon Valley and out of nowhere, Malili town sprung up right next to the borders of the proposed, but yet to be built, Techno-City. Standard Gauge Railway (SGR): This is Kenya’s single largest investment in infrastructure. As is widely known, the project replaces the old Uganda Railway (also known as the Lunatic Line) from Mombasa to Uganda. The first phase starts from Mombasa to Nairobi with advanced plans to extend it first to Naivasha and then to Kisumu and Malaba. When the SGR is done, the railway will need return cargo i.e from Western Kenya or Nairobi to Mombasa to be viable, and to get more trucks off the road. Whatever the merits or demerits of this project is not for debate here but what must be stated are the numerous economic activities and developments that have been brought about by this project. As the SGR is constructed, groups of the thousands of workers involved must be watered, fed, housed, clothed, transported, treated and entertained along the route. This direct and multiplier effect of the project is an indication of heavy spending. Elevated sections of the railway are a sight to behold especially for one who has not travelled the route for a long time. Major site stations chosen include Makindu, a town whose most distinct feature is the Sikh Temple. A Skygo motor cycle assembly factory is one of the new investments set up by a local born and bred entrepreneur, while new entertainment joints such as Shushan Place and Oasis have emerged. At Emali, Nakumatt, Kenya’s largest Supermarket chain by sales volume, products variety and retail outlets has deigned it fit to set up shop. The petrol station eateries of Mtito Andei which marks the half way stop between Nairobi and Mombasa have changed tremendously. Weary travellers alighting from luxury coaches can now relax in massage chairs. Voi town has also enjoyed a boom in construction of residential and commercial real estate that as previously unimaginable. These are all visible signs that there is money along the highway. Oil Pipeline: Kenya is replacing its over 40-year-old Mombasa to Nairobi oil pipeline. This project has also attracted huge groups of workers contributing to the activity along the highways in camps and sections nearby. Concrete Poles Not to be forgotten as a major activity is the replacement of old wooden electricity poles by the Kenya Power & Lighting Company with heavier concrete ones. Conclusion: This article is not intended as a feel good piece but an appreciation of tremendous changes that have taken place along the highway. The writer has not spent time in many of the centres and towns to appreciate other factors such as the availability or lack of water, sanitation, waste management or security among others let alone whether much of this development is affordable, planned or sustainable. But for long time travelers, it may be worth it skipping that flight to Mombasa and instead taking a day long drive and appreciate the changes that have taken place along the highway. Although the Mariakani Weighbridge headache is ever-present, newer routes into Mombasa or the South Coast are opening up. Both County and National Government are endeavoring to create alternatives through Kaloleni to the North Coast and Samburu to the South Coast. Today’s children will never know what the old highway looked like before, e.g why Man-Eaters was named so, or appreciate that the drive down to the Coast used to be about five hours only (it now takes about 10 hours to drive between Nairobi and Mombasa) or why is the lane going towards Mombasa is smoother than the uneven lane climbing towards Nairobi. But who else to tell the story than their parents when caught for speeding between Mtito-Andei and Voi by the NTSA? This entry was posted in Kenya domestic tourist, Kenya motoring, Kenya Railways, SGR and tagged Mombasa, road trip, SGR on August 20, 2016 by bankelele.